The All Golds are delighted to announce a trio of new sponsors whose logos will adorn the run-on staff’s clothing and the substitutes’ bibs during the upcoming season in the Southern Conference League. 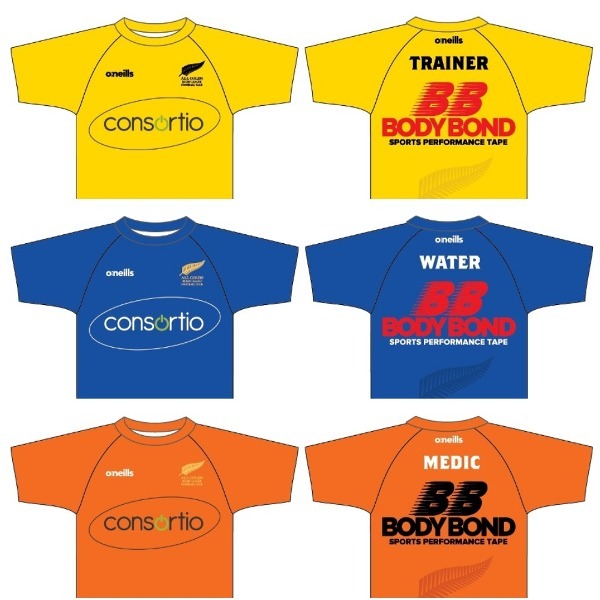 Cheltenham-based business management consultant, Consortio will have their logo on the front and Body Bond, a sports injury tape and strapping supplier for teams and athletes throughout the South West, will have their logo on the back of the yellow, orange and blue shirts of the All Golds’ trainers, medics and water carriers respectively. In addition, S.K.I.AGENCY Ltd groundworks, who are based in Gloucester, will have their name and logo on the substitutes’ bibs. All Golds’ director Joe David said: “We are excited to team up with three more local businesses as our sponsorship portfolio continues to expand. As with the All Golds playing strip, the shirts will be supplied by O’Neill’s.